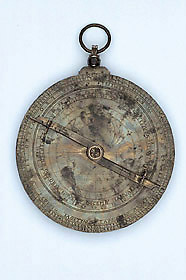 This astrolabe is of the early Gothic type, with a quatrefoil inscribed in the rete. The trefoil and quatrefoil types precede the 'Y' type which subsequently spread throughout Europe. The Capricorn band has at its ends the head and the tail of the Dragon, as in many Gothic instruments of this type.